I woke up with coffee while refreshing the Apartment Therapy page, anxiously awaiting the whip and chair that will force me to clean house from top to bottom in one month. I have surely slipped into some alternate reality where I look forward to the torture that is cleaning my house. How this can happen is beyond me but it’s happened 3 years running now. It’s the mop and bucket family reunion. I have Harry Potter online friends, horse owning online friends, and Apartment Therapy’s January Cure has given me a very large group of non-clean freak friends that are almost as disorganized as I am. This is the real reason I tune in and get excited at the end of December. My buddies! I live for reading the discussions, commenting on posts, posting myself and getting to know everyone. HAZZAH!! The first assignment was just posted and it is NOT THE FLOORS! WOOT WOOT WOOT WOOT! Today’s assignment is to declutter just one single drawer. How easy is that? 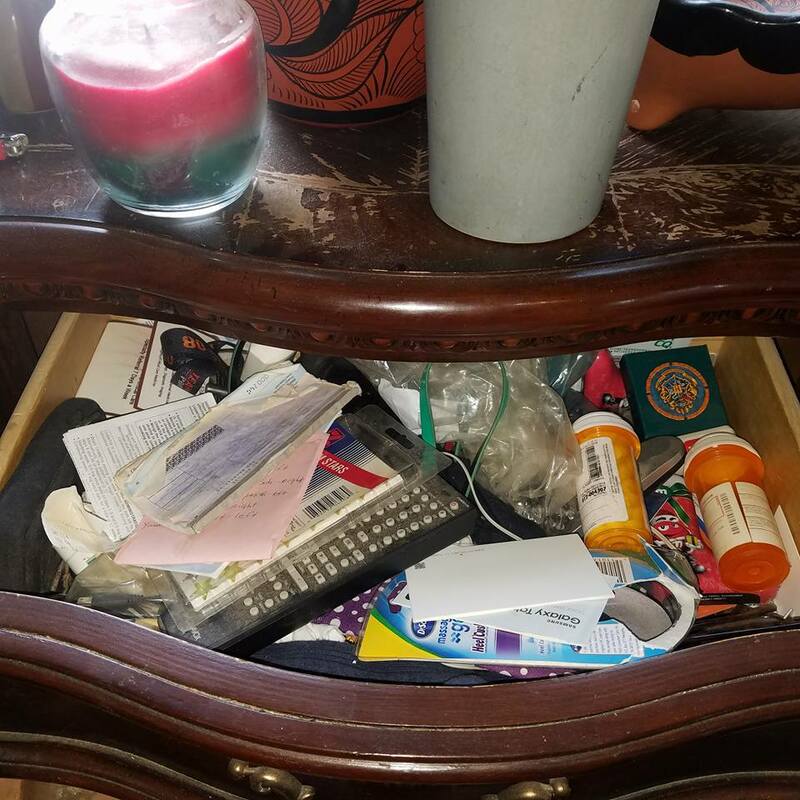 Of course, you haven’t seen my nightstand drawers. I’ll pick the worst one. 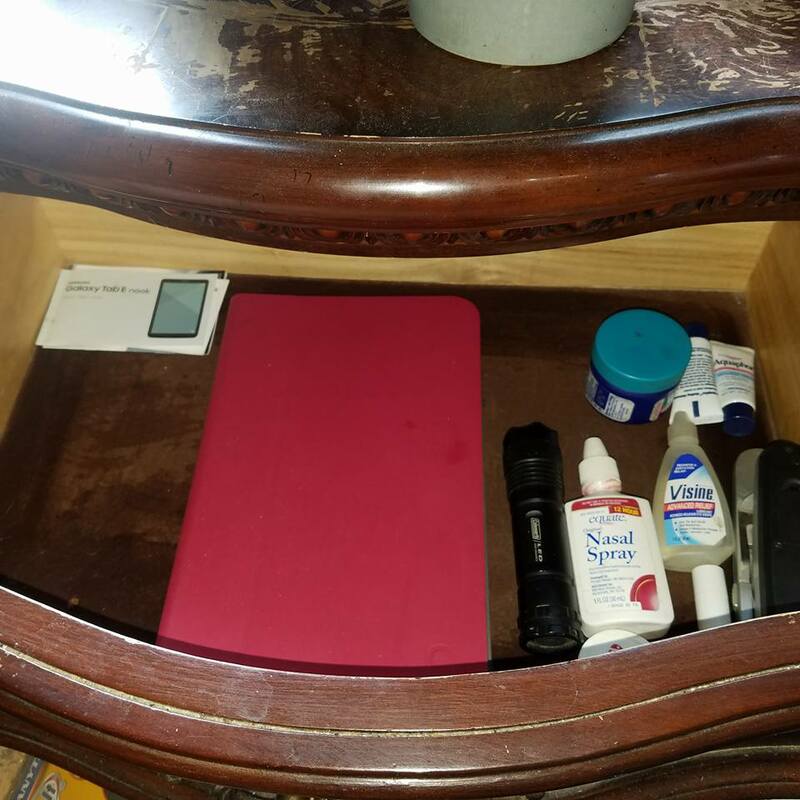 Top drawer, left nightstand. I will take before and after pictures. It’s really a mess. Little odds and ends. Guaranteed to take an hour to sort through, pitch and relocate all those odds and ends. But there’s a problem here. No flowers? We’re not supposed to run out and get ourselves a bouquet? Every year I’ve done this we’ve first had to get flowers to perk ourselves up for the tasks ahead. Every year I’ve immediately looked at my cluttered and disheveled counters full of mail, baking ingredients, gifts that haven’t been put away, snacks, etc. and thought “Okay, so where do I shove a vase of flowers? Between the bags of flour and sugar or can I shove those tins of cookies and popcorn out of the way enough to make room?” But not this year! This year I had company in for the weekend so I had to make the clutter disappear by friday. This year I have plenty of room for flowers so it’s only appropriate that this year they’re left off the first day to-do list. I call MALARKEY and I’m going to be a rebel and pick up flowers anyway. Okay, so, it wasn’t what I’d consider “easy”. Easy is mixing a shot of Frangelico in a cup of eggnog and watching something on Netflix. Cleaning the dreaded nightstand drawer was like uncovering an archaeological site wherein several civilizations are buried. So I removed the top layers and found a first gen iPod, 7 old pairs of reading glasses, two dozen pens of various types, jewelry, pills, birth certificate, old check book (from 10 years ago), thermometer, hand creams, chapstick, several pairs of ancient earbuds tangled up with everything else in that drawer, bottle caps, hair bands, hair clasps, chocolate frog cards, bubble gum turned to granite, a couple of “neat rocks”, old bankcards (5 to 8 years old), candy wrappers and book lights. What’s worse than a bunch of totally useless, non-working junk taking up space in a drawer? The bottom layer of fuzz, critter hair, and change, that’s what. 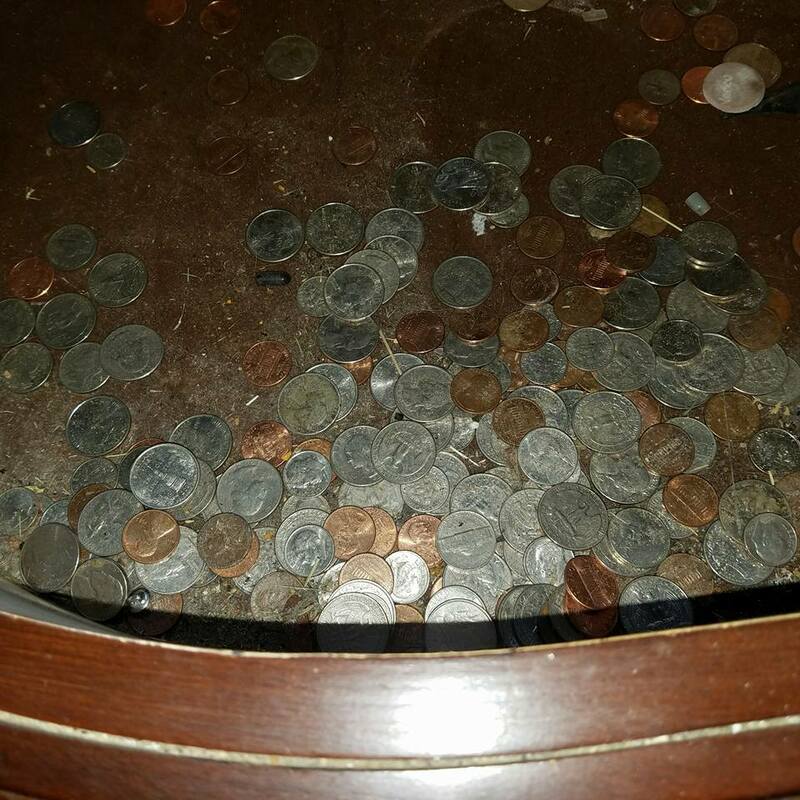 There may have been enough change in this drawer to take myself out to lunch at some place fancier than a fast food burger joint. Obviously, I need to eat larger pickles because just this change filled 3/4 of a dill spears jar. The end result, is the jewelry I couldn’t find is now in it’s proper place where I can find it, things I often actually need at bed time are where they can be reached at bed time, hardware has been moved to where hardware should go, the glasses are bagged up for charity, the now-I-know-where-all-my-pens-went pens are now with office supplies in a closet that was “Cured” last year and has remained healthy for an entire year, medications and supplies are in the medicine cabinet or first aid basket in the pantry, and the drawer is vacuumed and wiped clean. Okay, but first I need to get fresh gas in the tractor. Once I coerce the engine into starting I’ll be able to scrape a good straight landing strip for John’s remote control plane. Oh. Sorry. Not that kind of landing strip. Jargon often confuses me, as it is often meant to do. Jargon is also often meant to make a speaker or writer sound more intellectual or a product more effective or important than any other product in the history of human invention. There is no ill will involved in calling a place to unload when entering the house a landing strip, it just sounds cooler than dump zone. There are much more annoying and dangerous sorts of jargon, but I will, never-the-less, be calling it a place to unload or a place to hang my keys and sort mail. I have to head out this morning to get baskets that I didn’t have yesterday to organize the items left in my bathroom cabinet. I’ve already gone through and tidied the kitchen, desk and bedroom (insert head pat here) so that I’ll be leaving and hopefully returning to a still clean home. This hinges on the behavior of the dastardly dachshund duo while I’m away. While I’m out I’ll see if I can find a suitable mail/key holder that will fit the few places I have to put such a thing. I’ll figure it out. 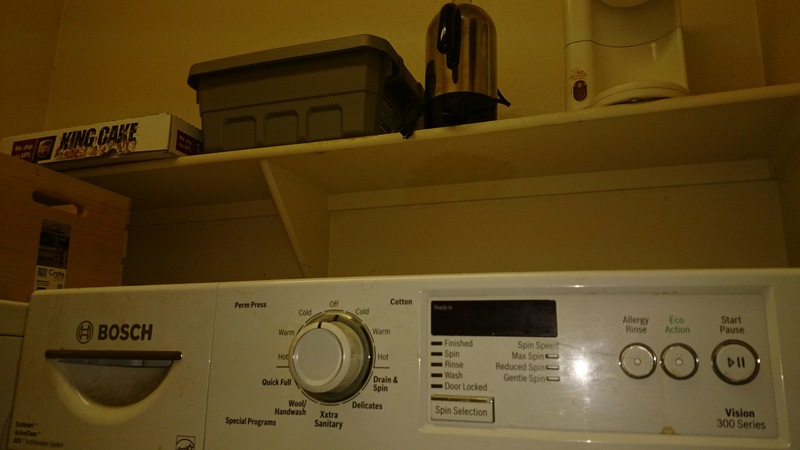 I’ll take measurements of a couple of spots before I go, but it’s highly likely that whatever container I find for my unloading zone will end up on top of the washing machine. I sort junk mail out before I even enter my house and drop it in the dumpster on my way through the garage. Thank all the gods I have a dumpster because I really don’t want to have a trash can near wherever my unloading zone ends up. I would have to stare at it all day. Under the sink, fine, tucked into the space between bed and nightstand, fine, hidden behind the toilet is fine. I’m also not apt to hang purses or coats or clothing on my walls. Coats go on coat racks behind the laundry door out of sight. Purses are hung on a rack behind a closet door in my bedroom, also out of sight. Such things are tools to me, not decor. If I didn’t have closets, out of the way niches, or doors to hide non-decor items behind, I’d either build something or resort to plastic bins camouflaged with a cloth with decor items on top. I know, it’d be easier to hang my purses along a wall rather than to dig them out of a covered bin, but that’s me. 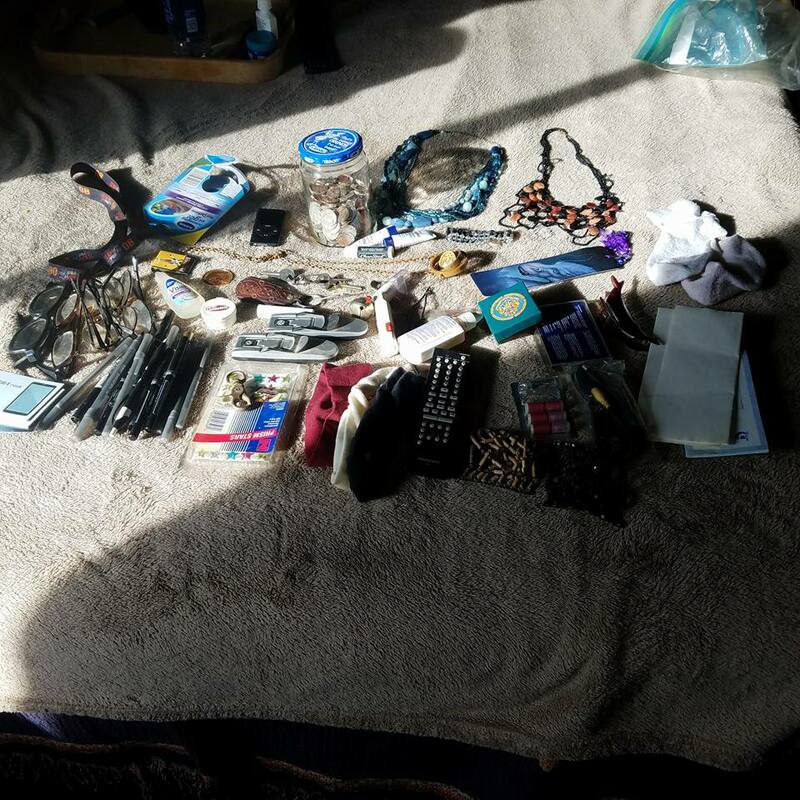 I don’t want to stare at purses, or a hanging file for mail, or even keys for that matter. So, off I go to brave the road construction that baffles and confuses the already baffled and confused snow birds in Surprise. Hot diggity dog. Well, my foray into town was only marginally successful. I did find inexpensive containers to corral the cosmetics and facial cleansers. I’m not in love with them, but they’re doing their job. I stopped at Walgreens and loaded up on voodoo and snake oil products to help me live in better harmony with my wrinkles. We’ll see. I’m sitting here with a freshly cleansed face, Retinol soaking into my crinkles, and moisturizer moisturizing. I applied my entire daily allotment of imagination trying to find something I can live with as an organizer for keys and mail but was unsuccessful. Thus, here is the before and after picture of my place to drop stuff. Mail and keys are to be found there henceforth. If I can find or build something relatively attractive to sit there for sorting mail, great, if not, at least it’s in one spot. The crate at the edge of the frame holds our umbrellas and flashlights. Behind the door is where my barn coat hangs currently, but if/when I remove that door I’ll probably do something illogical like oh, I dunno, hang it in my closet where it actually belongs.